Can You Drink Safely with Splenda? My first personal encounter with Splenda was mind-boggling. I was offered three choices for sweetening my hot tea -- raw sugar, white sugar and Splenda while dining at a hotel restaurant. The name sort of rang a bell; I had previously come across several times when I was reading about diet sweeteners, but I could remember no more than that. 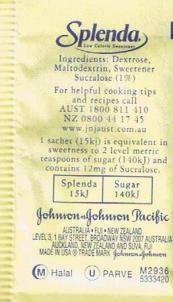 On each of the tiny yellow sachets by Johnson & Johnson, it was printed at the front "a low calorie sweetener", "15kJ of Spenda = 140kJ of sugar". Immediately, I associated those food labels with some artificial sweeteners. Then, I went on to discover another claim on the packaging front, "contains no Aspartame or Saccharin", which makes me wonder if it has really become mainstream knowledge that artificial sweeteners don't feed our body what it needs; they fool our body and are capable of causing unimaginable, serious harm to our body. And how sincere is Spenda, with dextrose, maltodextrin, and sucralose as its three listed contents, in coming to our rescue as the newest chemical sugar replacement made from real sugar? The line which caught my attention most was "made from sugar and tastes like sugar", now this is incomprehensible, it sounds like some sugar minus the calories, or some kind of skimmed sugar. If it's made from sugar, of course it goes without saying that it will taste like sugar, and if it's really made from sugar, then why sugar isn't sold as one of the ingredients? There seems to be a fishy catch somewhere. Reading up on this diet sweetener gave me some clue about what it is, but led me to even more doubts and questions about this sweetener, which is the newest, and perhaps now the most popular product in a long line of sweeteners promising the taste of sugar without the effects of sugar consumption. It is 600 times sweeter than sugar, so very little of it is needed to sweeten foods, it has no bitter aftertaste, and it is now used in thousands of food and beverage products such as carbonated soft drinks, low-calorie fruit drinks, yogurt, breakfast cereal, ice cream, and dietary supplements. Splenda's core ingredient, sucralose, is manufactured in laboratories as a synthetic compound. Despite its similar-sounding name, sucralose is not the same thing as sucrose, the technical name for pure table sugar. Thus, Splenda is not sugar. But how fair is it to claim that Splenda is made from sugar? Splenda's manufacturer counters that even though the sweetener contains no sugar, the process to make the sweetener does truly start with sugar. So, it's an interesting sugar paradox – a food creation process that starts out with cane sugar but ends up lacking it because the sugar disappears in the manufacturing process! It's hard to be convinced or imagine that Splenda is a natural food, especially when it's manufactured in the laboratory. The fact that the FDA approves or disapproves a new food, in no way assures it is free of health hazards. Powerful lobbies make big money pushing through products that will potentially do well in the marketplace, while blocking others that are not economically viable. And without long term studies performed on this diet sweetener, only time will tell how safe this product is as real consumers worldwide become its test rodents. When doing a quick find from the internet, already there seems to be some cases of health side-effects cited after using the sweetener - seizures, rashes, intestinal problems, fatigue, anxiety, numbness, and headaches. A scientific review of sucralose published in the Journal of Toxicology and Environmental Health also revealed a list of health concerns, including toxicity, DNA damage, and increased carcinogenic potential when used in cooking. For me, all these seem to conclude that there is no "free ticket" to bingeing all the tasty sugarfree products without sacrificing our health for it. So, meanwhile I will stick to a safer choice, table sugar, and replacing it with a natural sweetener, honey, whenever possible to reduce empty calories. End of "Can You Drink Safely with Splenda?" Back to "The Silent, Sweet Killer -- Aspartame"